On Tuesday July 18, NZPWI’s Kirsty Quested had the privilege of speaking to TNA mainstay and all-round pro-wrestling legend, Kevin Nash. An integral part of the TNA roster since 2004, Kevin brings a wealth of experience to the promotion, having been a major star in WWE and WCW. Debuting in WWE as Shawn Michaels’ bodyguard Diesel, Kevin rose rapidly through the ranks of the WWE roster to become WWE Champion. His friendship with Shawn Michaels, though tested on screen, remains to this day very close, as it does with his other old Kliq buddy, Triple H.
Kevin made the transition to WCW in 1996, along with another close friend, Scott Hall. They entered WCW as The Outsiders, and would later team up with Hulk Hogan to create one of pro-wrestling’s most famous stables, the nWo. Between them, they would help to ensure WCW’s weekly show, Nitro, was the highest rating of its time. The nWo would also make a huge splash in WWE when the promotion bought out WCW, but an injury in 2002 would see Kevin out of action for almost a year. Kevin has also branched out into the movie industry, with small roles in movies such as The Punisher. In 2005 he landed a starring role in a remake of The Longest Yard, which he describes as his favourite movie experience. Later this year, Kevin will appear in DOA: Dead Or Alive, a film based on a video game. Now part of TNA’s roster, Kevin juggles his movie career with wrestling. A heart scare kept him sidelined since October, but he has now returned to the ring with a vengeance. Kevin took time out to speak to Kirsty just before the iMPACT! tapings. Kirsty Quested: He has been one of the most influential figures in modern wrestling history. 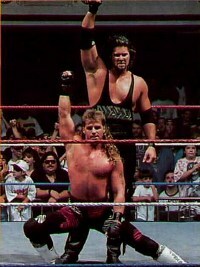 He was elevated to the top of the WWE roster in record time, becoming one of the most popular champions of the 1990’s. He co-founded one of the most famous stables in wrestling history, the nWo. He has branched out into the film industry, starring in the 2005 blockbuster, The Longest Yard. 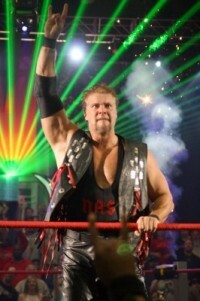 He is now a veteran of TNA’s roster, he is Kevin Nash. Kevin Nash: Good, how are you? You’ve just had the Victory Road pay-per-view, which is kind of an anniversary for you, since you came on board with TNA at the same event in 2004. What are your thoughts on how the promotion’s progressed in the last couple of years? I think it’s going in a positive direction. I think there’s been good growth. I think the partnership on Spike TV’s been very good for the promotion. I think a lot of the young talent’s now had a couple of years to become a little bit more seasoned. I think the performances are better, so all in all I think that we’re really going in the right direction. TNA’s created a lot of new young stars, as you were saying, especially in the – ahem – X-Division. Are there any that really stand out for you? Several, I mean the guys that I worked with last night, Jay Lethal and Sabin I think are both great. I think Alex Shelley’s a really good talent. I think Petey’s a good talent. Kazarian came back last night, he’s a good talent. There’s at least a half a dozen off the top of my head, and probably a lot more than that. Who in TNA would you say brings out the best in you, physically and creatively? I’ve had probably a 15 year feud, on and off – as his ally, as his foe – with Sting. Jeff Jarrett of course, seems to always bring out the best in me. Scott Steiner. But lately I’ve really enjoyed working with the X-Division guys. They seem to be lighting a fire under the old man. You mentioned Sting, and you’ve worked with him a lot over the last 15 years, what’s it been like working with him again in TNA? I know you haven’t been directly involved in any feuds, but what’s it been like having him back in the locker room? It’s great, it’s always good to see an old friend. We actually had breakfast this morning, and went to a couple of outlet malls around the Orlando area, kind of hung out before we came to TV today. So it’s nice, because most of these guys I really don’t know, he’s one of the few guys that I’ve been friends with for a really long time. Is a shot at the NWA World Heavyweight Championship a concern of yours at this stage of your career? Because I was off for a while, I wouldn’t want to go after it until I was physically able, had a little bit more ring time, so right now I’m just content doing what I’m doing, just kind of working my way back in slowly. But I know I would like… if Samoa Joe was to get the title, I’d like to have a chance because he’s undefeated, I’d like to have a chance to end his streak. But that’s about it. You mentioned that you’ve had the time off; how are you feeling since the heart scare? Good. I was lucky that it wasn’t anything too severe. It was something that could be taken care of with a little bit of medication so… now I’m not even on the medication. Well – you actually look as if you’re in the best shape of your career. Have you been training and eating differently since then? … I’ve really cut down my beer, wine and stuff like that. So I’ve just kind of cleaned my life up a little bit, because I’ve got a little 10-year old boy I’d like to… at least watch him get married, if not more than that, but I’d like to be around for a while. You’ve been through WWE, WCW, now you’re in TNA, so you bring a really broad range of experience to the table. Do you have any plans to apply that knowledge in a backstage/creative role when you retire from physical action? Yeah… I don’t know how much longer I really want to do this in that physical capacity, but as far as… you know, just to sit around… and I like the creative, the creative system here really seems good, because it’s several guys pitching ideas together, and I think that’s… you don’t have the pressure of trying to come up with ideas on your own. But I’d also like to do more of an on-camera kind of a… maybe someone who could go up against Cornette, as maybe a bit of a heel entity. But I don’t know, I’m just kind of playing it by ear, but I’m enjoying myself. It’s been nice because I don’t have the pressure of being in that main event title chase, which kind of takes the pressure off. So I’m just having fun. How would you compare the atmosphere in the TNA locker room to other promotions that you’ve worked for? I think it’s really great. I was hanging around with a lot of the uh… Lethal and Alex and Sabin yesterday, spent most of the day together just laughing and joking and stuff. It reminds me of when Shawn Michaels, Scott Hall, Sean Waltman and I just kind of sat around early in our careers and just… there’s just a real passion for the business in a lot of the young guys. They haven’t been tainted yet. They do it because they’re happy to do it. Since you bring up Shawn, are you still in touch with him and with Hunter? Oh yeah. Actually I talked to Triple H yesterday. He’s on the countdown to having his first child. Yeah I was just thinking that Stephanie must be ready to pop any day now. Yeah, she’s actually due… I want to think 23rd is the due date, but I know that it’ll be any day, so he’s really looking forward to that. I had a good talk to him yesterday, and I talked to Shawn about four or five days earlier. Hall’s hard to get a hold of, because he’s running constantly. But Shawn, I usually talk to Shawn at least once a week. What are your thoughts on the D-X reunion? It’s been hilarious. It’s been some of the funniest stuff I’ve seen. I think you have to have a really wide spectrum of things. The comedy’s one thing you have to have, given comedy like they do, it’s very entertaining for the fans. Oh definitely. When they’re allowed to let their comedic talent shine, it’s pretty special. As a fan I’m really loving the D-X reunion. I’ve also just finished Shawn’s book, and he speaks very highly of you. Have you read it? You know the old saying – never say never, and you’ve got your buddies there – would you ever consider returning to WWE? It’d be hard. Their schedule is so rigorous. I work three times a month here, and I basically drive 70 miles to get here and 70 miles back. I live in Florida, I never have to get on a plane, so… I leave my house at 12 o’clock in the afternoon and I can basically come home and give my son a kiss goodnight. That makes it kind of advantageous for me. I was on the road for so many years and missed so much of my son growing up, missed so much of my relationship with my wife, because I was gone. Back with the WWF, we worked 250, 300 days a year. And I’ve already made those sacrifices. I could do it short term, for a couple of months, three or four or five months maybe, but I couldn’t do anything long term. Different set of priorities now. Yeah, and I’m fine with that. I’m very, very content where I’m at. You mentioned Scott Hall a minute ago, and that he’s difficult to get in touch with, but as far as you know, how’s he doing? Um… well if history’s anything… I mean, the last time I talked to him he was fine, but when he doesn’t return calls it’s usually not a good sign. I pray he’s doing good. You’ve been branching out into movies over the last few years; what’s been your favourite film experience so far? I would say The Longest Yard, with Adam Sandler. I enjoyed that. But I had a lot of fun on The Punisher also. You run the risk of being stereotyped into the “big guy” role; but the Guard Engleheart character in The Longest Yard shattered that stereotype. Did you have much input into the development of that character? Really it was very… one thing with Peter Segal, the director, he directs loosely from the script, you do maybe one or two takes from the script, then he likes to play with “give me a couple of different feels and a couple of different looks”, I’ll come up with something, he’ll come up with something, Adam will throw something in, so by the time you get done with it, most of the scenes were pretty much ad-lib scenes. It must have been a blast getting to shoot a movie like that, especially with old wrestling buddies like Steve Austin and Bill Goldberg? Absolutely. Absolutely. And it was funny because there were really no women on the set, so it was kind of like a fraternity house. Bunch of crazy jocks… it was a really good time, really good experience. You mentioned The Punisher before, and I was just thinking… you’ve taken lots of bumps and you’ve bled profusely in the ring, but during the filming of The Punisher Thomas Jane accidentally – but legitimately – stabbed you with a knife. How’d that happen? Thank God it was blunted, but the weapons guy that was switching out the knives, and he made a mistake, didn’t switch it out. He didn’t get the one that had the spring in it, where the blade would retract. Thomas Jane must have felt awful about that, he’d be thinking it was a retractable knife and it wasn’t. But mistakes happen. I mean that’s probably what happened to Brandon Lee, you know? Yeah, yeah. Thank God it wasn’t the same outcome eh? Your latest film, DOA, is based on a video game. Can you tell us about your role in that? I play Bass Armstrong, which is Tina Armstrong, who is Jaime Pressly, I play her father. And basically, the gist of the movie is that we’re going to this island to have a kind of “winner takes all” type of combat, and I’m basically there to try to talk my daughter out of fighting. Except that I push her to the point where she decides the only way this is going to happen is she’s going to take me out, and she ends up having a battle with her dad on a raft on a Chinese lake. Corey Yuen was the director. He shot the first Transporter. Do you plan on expanding your film career further, and is there anyone you’d really like to work with in movies? Well… I’d love to work with Ferell, I’d love to do comedies. If I had my way I’d like to do comedies, but… there’s a couple of projects that are coming up in August. I talked to my agent, and he said there’s Mortal Kombat 3, in casting… the thing with me is it’s still hard, because you walk into a room, you’re still so big, they just go “wow”, so it is hard to get roles besides being the big guy, but with all the comic book type roles that are out there now, I have a chance to get those roles. I think you’d be great in comedy. I think that really came out in The Longest Yard. Yeah, and I’d really like to do that, hopefully something’ll happen, I’m wishing on that. What would you say has been the pinnacle of your career so far? I would probably say The Longest Yard. I was probably the proudest of that. When I pass on, hopefully that’ll continue to be seen. 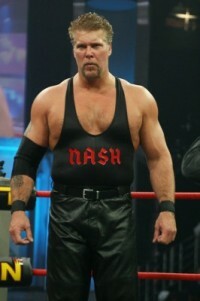 What will Kevin Nash’s legacy be? I don’t know… people that knew me, I’m sure they had a laugh if nothing else. Kevin, thank you so much for your time today, I really appreciate your taking the time to talk to us, I know you’re busy, and all the best for the iMPACT! tapings today.